A maritime climate is for places near the sea. That includes London, Dublin, Melbourne and Auckland. Most places do not have a rainy season and a dry season. In the northern hemisphere, temperate winds are from the west. The western edge of temperate continents usually get this maritime climate. Examples are Western Europe, and western North America at latitudes between 40° and 60° north (65°N in Europe). 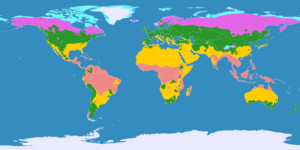 Some parts of the temperate zone, especially in the northern part of the continental climate, have severe winters – for example Moscow, Minsk and Helsinki – this is called a hemiboreal climate. Temperate zone Facts for Kids. Kiddle Encyclopedia.